So nearly four weeks since the last post, has it been that long? I was reading Z’s blog the other day and he mentioned that when he gets away from blogging, it gets harder to come back. Talk about being in the same boat there. Anyways, any way you put it, another month has gone by, so let’s catch up. First off, the obvious four week gap in posts probably equates to two or three things. First up, the inevitable life. Work is ramping up into full gear and I’m heading (or juggling you could say) a few big projects that is taking up quite a bit of my time. 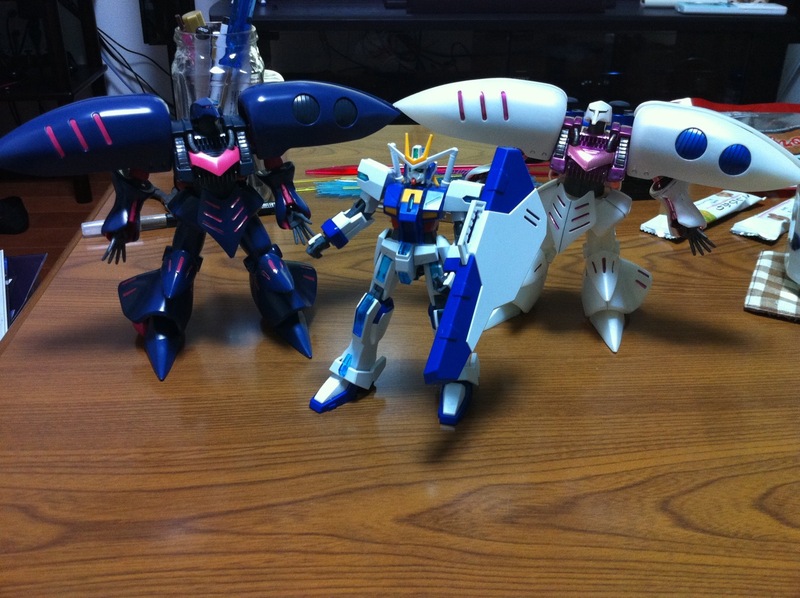 Add in that I spent nearly a week out of town at various locations in Japan means that there is less time to Gunpla. The good point is I did get to meet up with GaiGun for our usual get together in Akihabara (which is pretty much still month despite the fact I live half the country over? 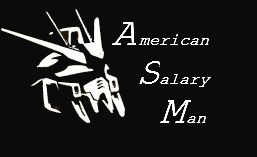 ), and catch up on all things life and Gunpla. But yeah, work has kept me busy to a point that when I come home, the last thing I want to do is look at the computer, which of course keeps me from actually writing blog posts. The other big factor in lack of posts is that it took honestly longer than I expected it would to get everything needed for the PGSF wing joint fix. 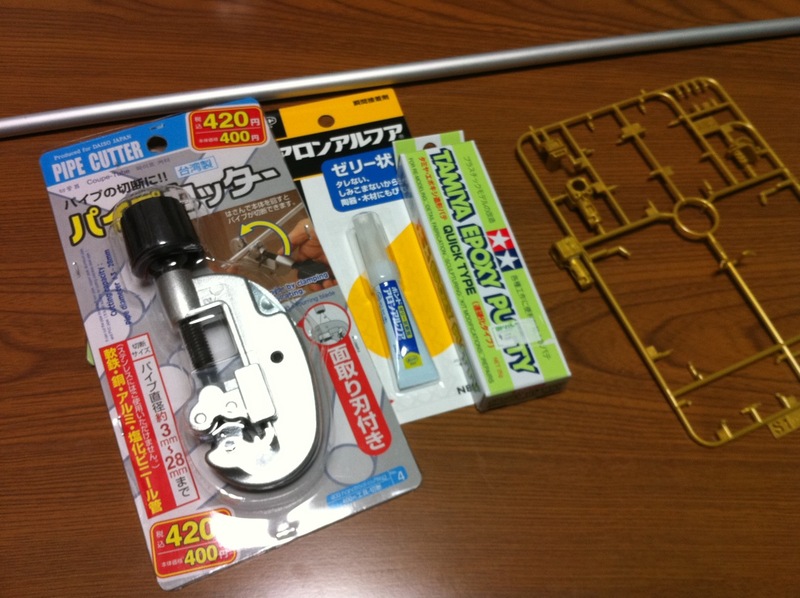 While I was able to get the pipe, glue, and putty no problem, the actual 3 or 4 dollar pipe cutter needed to make nice uniform rings, was out of stock literally everywhere in Osaka. I was a bit dumbfounded because I didn’t think that many people needed to cut pipes at the same time to warrant it being sold out everywhere! 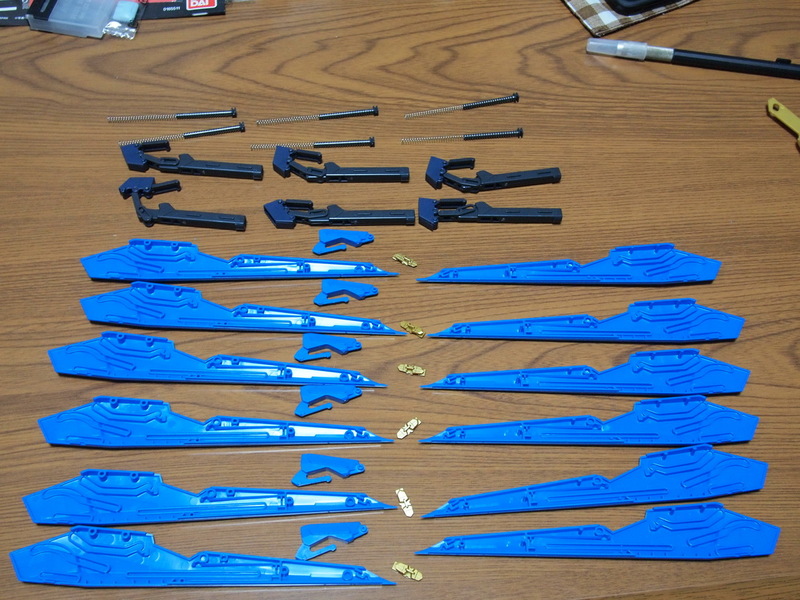 However, I managed to locate the needed cutter while on my business trip in Yokohama (a lot of them too, go figure) so everything is finally ready to go. But now that I have the goods, I’m finally getting back to the PGSF, and that should be my next WiP before finishing up the initial build of the kit. You should see the wing fix in action first on Gunpla TV as I’ve provided GaiGun with a few to give the wing fix a try on video. Fingers crossed that it’ll work out good. 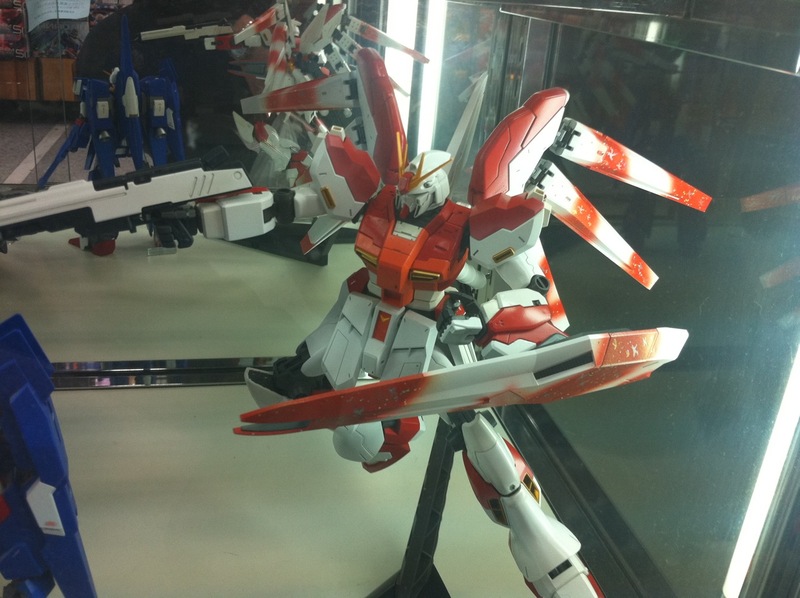 On the HG, SD, and RG side, there is a bit of excitement as the next RG is the Aile Strike. 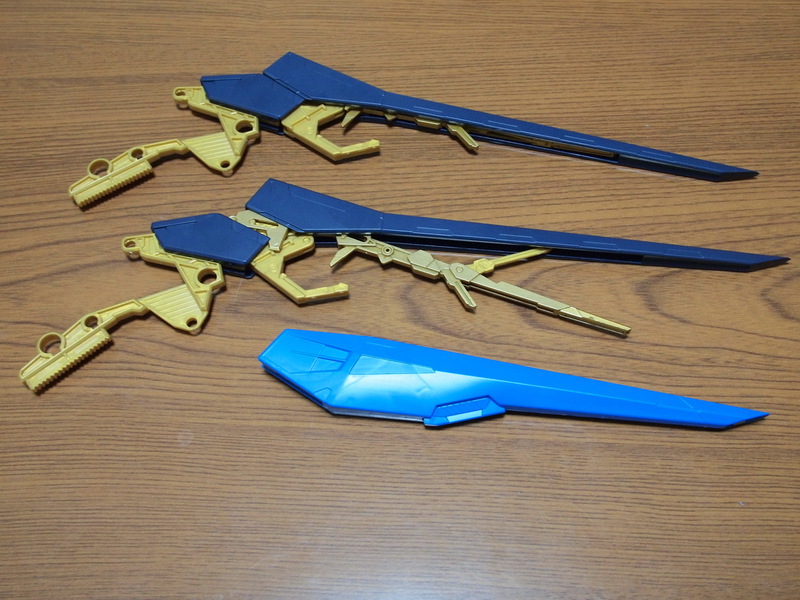 While I’m somewhat not surprised that they went this way, and had actually hoped for something a little more… different than the usual pattern, I am looking forward to seeing how well the RG quality and what not translates to the Aile Strike. 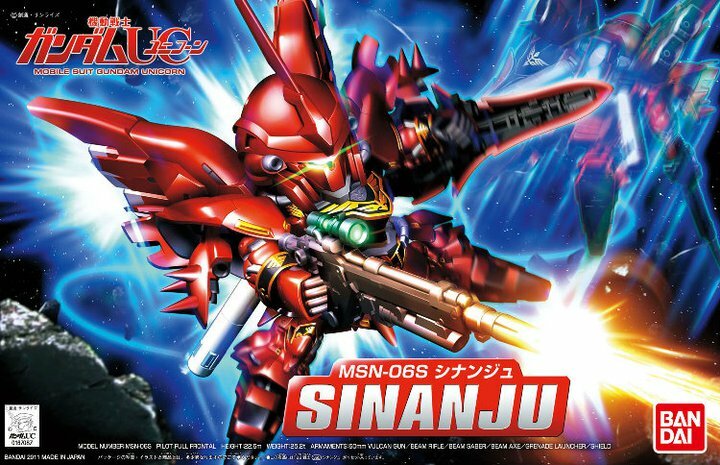 On the other hand, the upcoming SD Sinanju is definitely on my list. 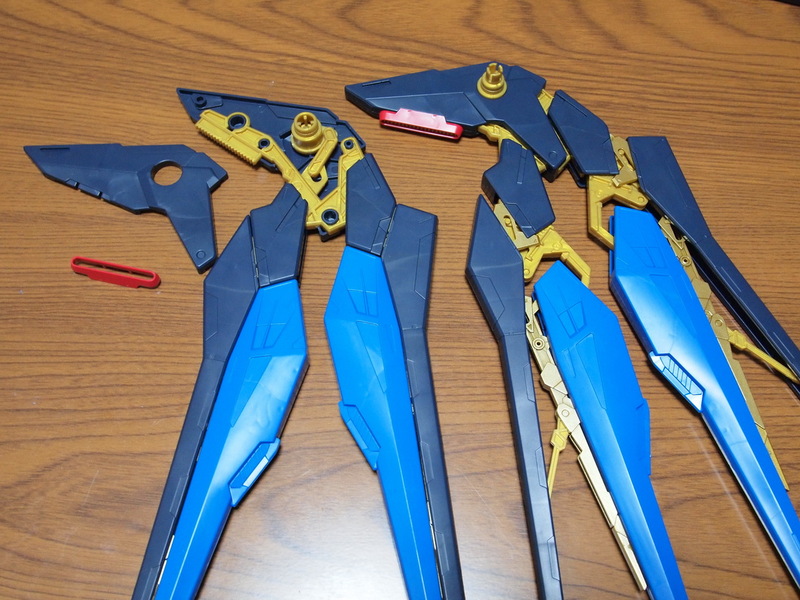 HG’s that have me interested are the upcoming ECOAS Jegen and Dreissen, but I still want to see finalized pictures for them before I make any other decisions. But like I said, I’m looking more at working through the backlog, then increasing it, and so my goal is to actually knock out quite a few kits. Initially I may just just snap builds to get the boxes and plastic out of the way, and then go back once we hit spring to start doing painting or mods to models that I want to do so for. 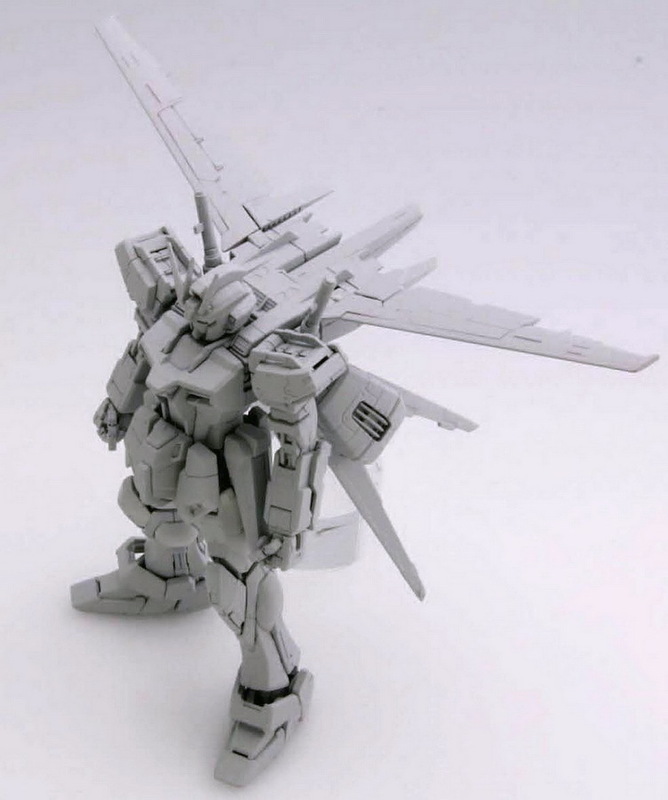 But in general, the next things to knock off on my HG/RG list is the D-Mode Unicorn, and the RG Zaku-II. 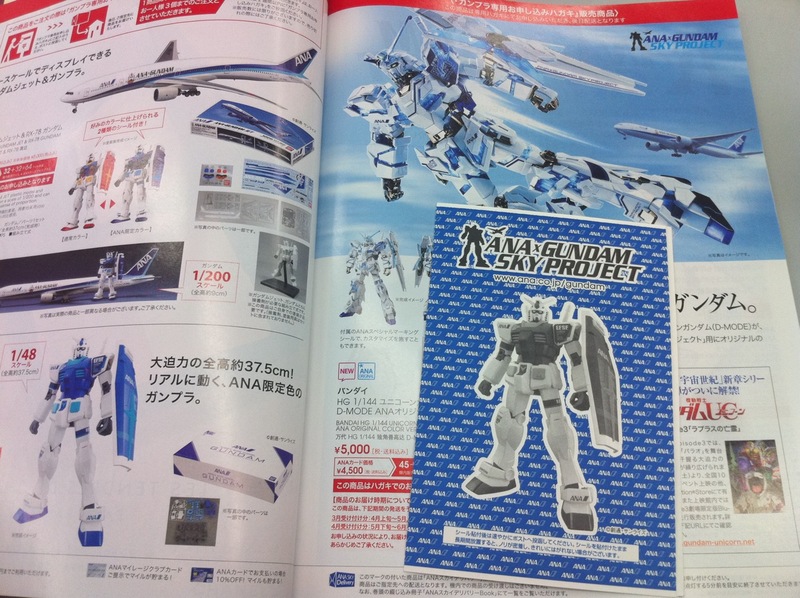 I’m also looking at doing the PG GP01 just because that box takes up a lot of space. Anyways though, things blog-wise and actual build-wise will continue to be affected by my work load, so we’ll see how March goes. What’s on peoples upcoming want lists or to build list for March? Oh, and while I say I don’t want to increase my backlog, I couldn’t help but jumping on ANA yesterday to fly to Tokyo on business, and grabbing a couple of special order cards while I was at it…. 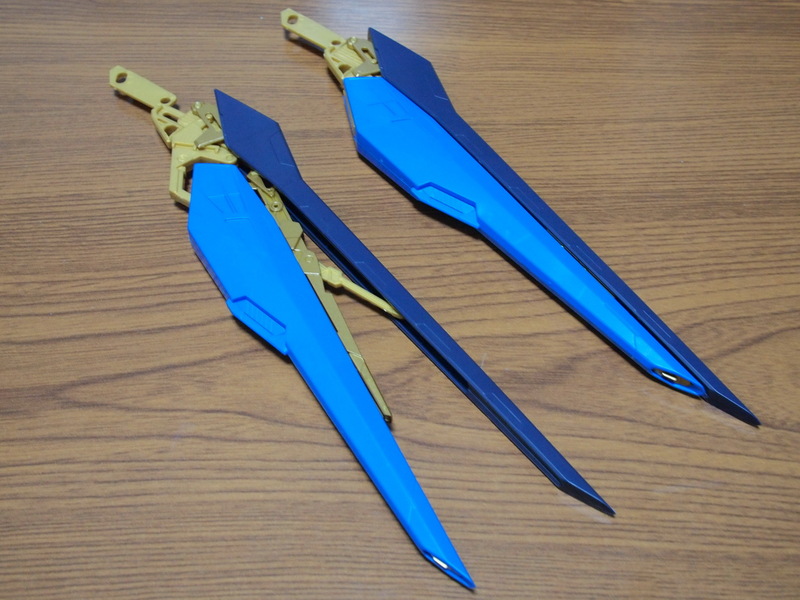 With the mobile suit itself finished, we move onto the next step, the wing units and dragoons. Otherwise known as the tedious part. 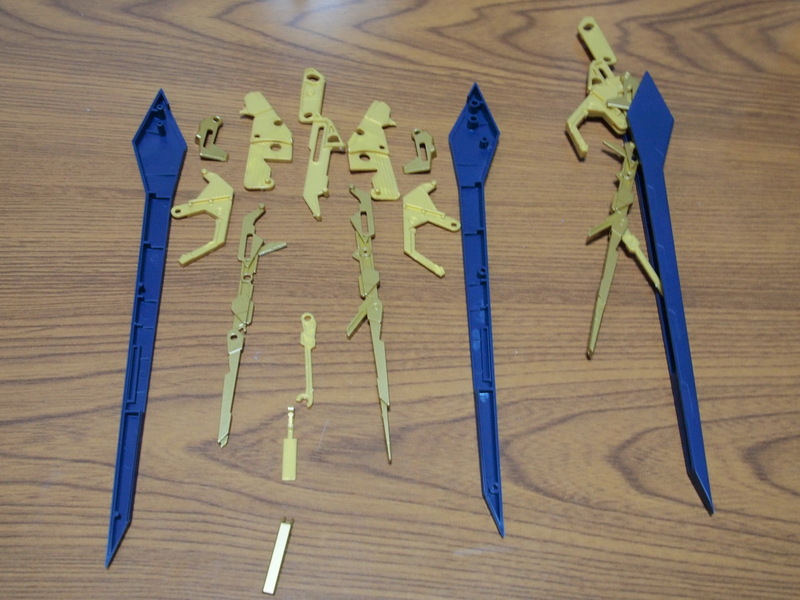 We all joke about weapons block, or decal block, and what not that tends to hit almost every model kit out there, but in this case, the Strike Fredeem has boring repetitive parts block. I found the best way to handle this was to just do it in bits and pieces off and on over the last week and a half or so. Business trips and the usual company affairs did keep me away for some nights so it’s not like it really takes that long. It just feels like it does. So, onto the dragon units themselves. Considering that there are eight dragoons, I went ahead and knocked this out over a couple of nights. I did a couple the first night to get it down, then set up an assembly to knock out the rest the next day. In particular, nothing special about this, just a gimmick to slide the “thruster” part of the dragoon in when you attach it to the wing tip. 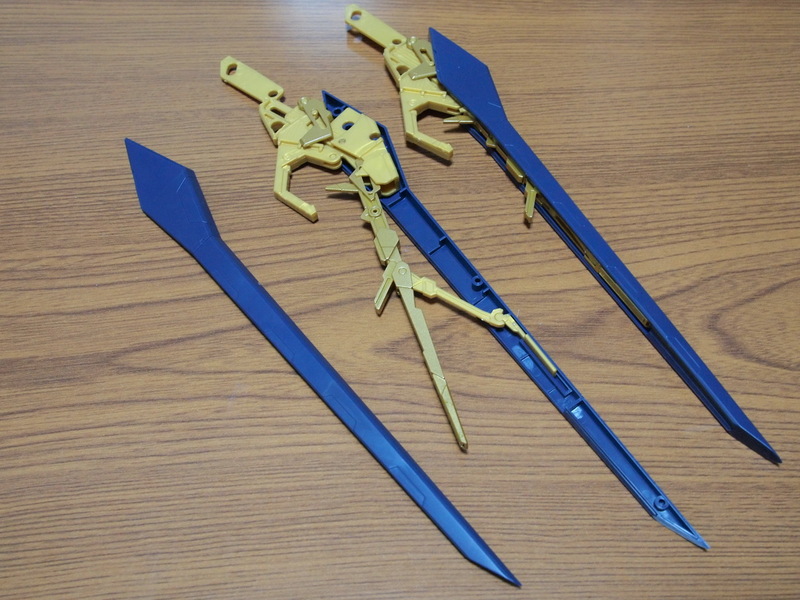 A step by step from top to bottom for the complete dragoon build. Setting up the assembly line. 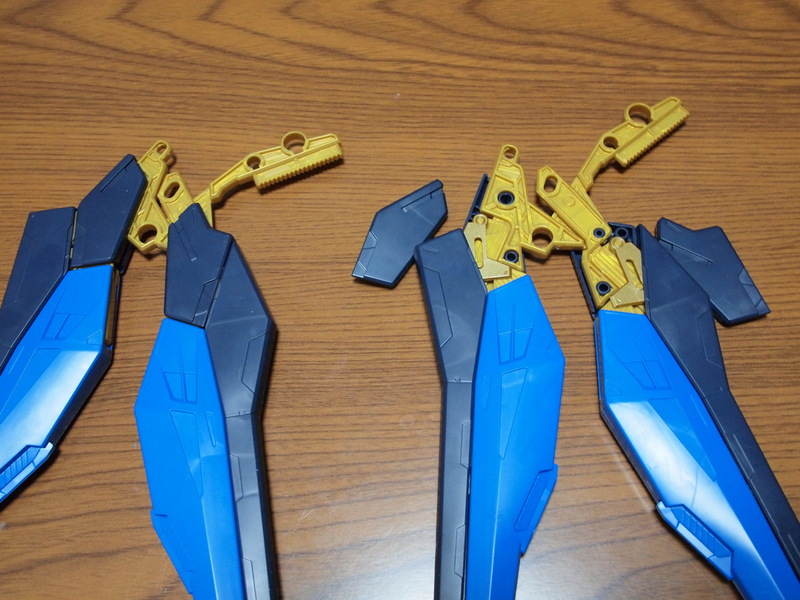 After working on the dragoons, we move onto the wings themselves. Basically there are four wing units with two wing tips, if that makes sense. It still means that you’re building eight wing tip units though. I knocked these out as well over three nights doing two or three units a night. 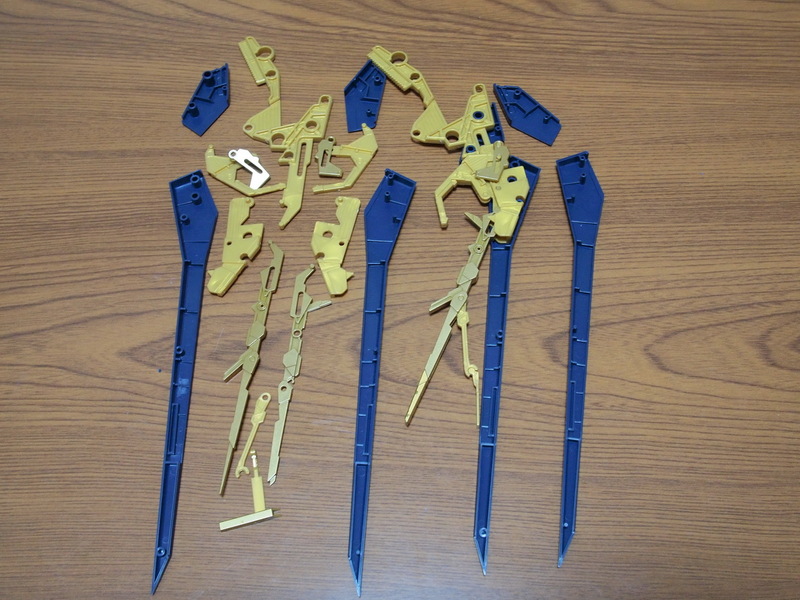 The parts needed to put the wing tip together. Put together you get some simple interlocking movement as well. Which you can see the range below with the dragoons attached. 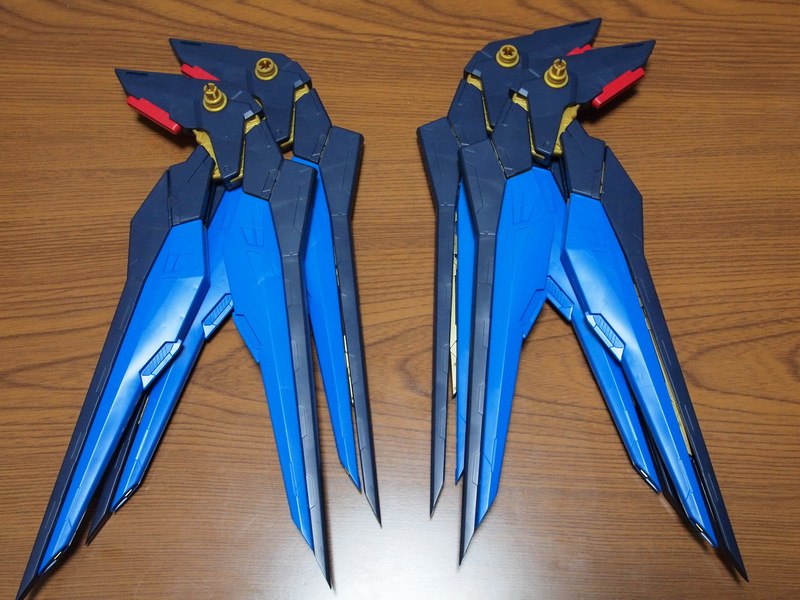 The second wing type, pretty much the same except for the top, which will connect the wing to the previous built wings. 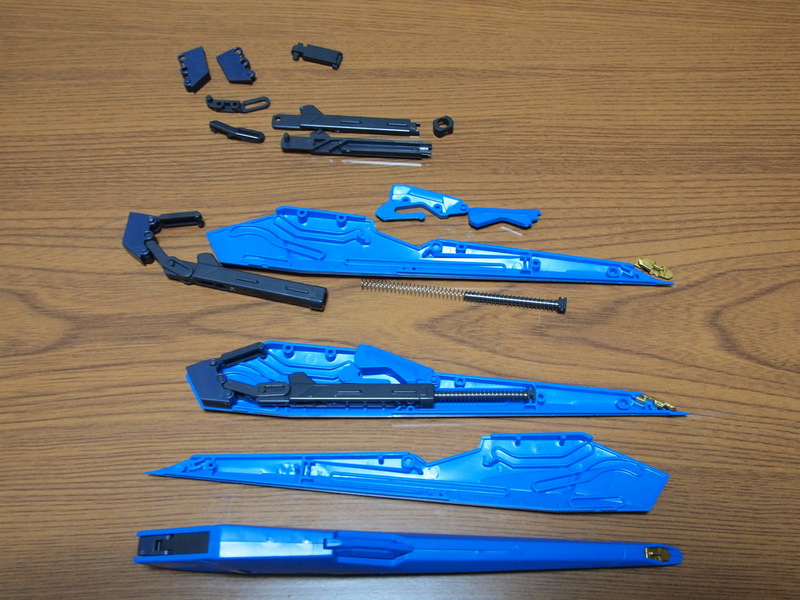 Same range of extension as the last parts. 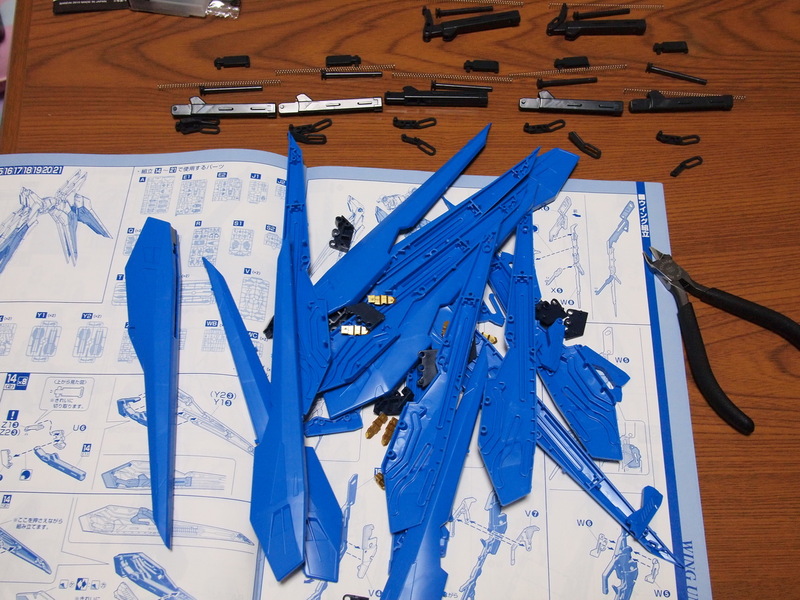 So after building all this wings, it’s time to put wing type A together with wing type B. And throw on the top and you’ve got one of your four wing sets. What you don’t see in the above pictures are the gold decals that are put on to highlight the wings and dragoons. I’m planning on saving those after panel lining and top coating. Overall, the wings are just huge. The length of one is easily the height of your average MG. The interlocking movement, while simple, works well. The downside is that the gold latticework, for lack of a better word, doesn’t pop back into the wing easy on some of the wings. Also, like Buster noted, putting the dragoons on and having them stay in the closed position can be touchy sometimes. I’ve taken apart a few of the wings and put them back together, but still have touch parts, or less that smooth movement. So that leaves very little left to do, just the connecter for the wings and the backpack. But that will be a section all its own, as I plan on tackling the wing joint fix.